Can Wealth Be as Big a Parenting Risk-Factor as Poverty? Many of us are now aware of the damaging long-term effects of growing up in poverty. The stress experienced by adults and kids who struggle to meet their basic needs can put kids at risk for lower academic achievement, health problems and emotional difficulties. On the other side of the economic spectrum, however, we are finding that kids who grow up in an environment of affluence may also be at risk for negative outcomes. This may seem hard to believe—kids growing up in a prosperous home would seem to have all the advantages. A recent in-depth study into this issue helps us understand that affluence may go hand-in-hand with some parenting practices that may not promote the ideal development for adolescents. In both situations of poverty and affluence the issue of resources themselves are often not the sole contributor to developmental problems in children. Both poverty and affluence create situations in which parents’ behavior may be altered to the point that they are unable to adequately support their children. In the situation of poverty, the stress of lack of resources often makes it difficult for parents to be as patient, attentive and supportive as they might otherwise be. In the case of affluence, parents’ behavior is also altered such that they might not be as emotional available or have enough time to spend with kids. The recent study points out two particular issues that seem to be the source of problems for kids. High expectations with conditional love: having high expectations for kids’ behavior, academic performance or sports is not a problem, per se. When high expectations are combined with lack of emotional support and conditional love, they do become problematic. Example: if a child is only valued or loved for what they can accomplish in the classroom or on the sports field, this actually undermines their development. Among affluent families, research finds that 25% of boys and 15% of girls describe themselves as “underachievers.” The obvious implications for children’s emotional development under these circumstances are worrisome. Isolation from parents: both emotional and physical isolation are more common problems among affluent families. 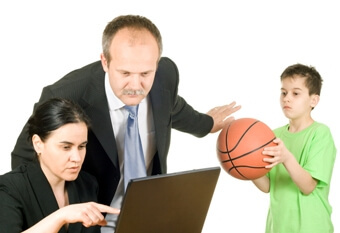 Due to kids’ expansive extracurricular activities, families may have little time together. This, coupled with increased physical distance due to larger houses, may create a situation in which adolescents feel increasingly distant from their parents. The statistics we see among affluent families illustrate the effects of this isolation and conditional love scenarios among teens. Affluent teens have higher rates of clinical depression (25% higher) and substance abuse (15-35% higher) compared to non-affluent groups. Teen girls, in particular, are at risk for depression—20% of affluent teen girls have clinical levels of depression. In both conditions of poverty and affluence, the types of parental factors that can mitigate the effects of each situation are similar. If parents can remain warm, emotionally responsive, supportive and provide some structure (without becoming a helicopter parent), then kids in both situations are much more likely to have positive futures. What is Strep and How Can it Affect Your Family? Amy Webb, PhD is a scholar turned stay-at-home mom with two young sons. With her blog, The Thoughtful Parent, she brings academic child development and parenting research into the lives of parents in the trenches of child-rearing. She does not claim to be a parenting expert, but rather a translator of academic research into reader-friendly articles.